A new Postcrossing stamp... from the Åland Islands! There are so many cool things about this stamp! First of all, images don’t do justice to its shiny metallic surface, whose colors shift from pink to purple. But there’s also the fact that this is a not a normal stamp… it’s heart-shaped! 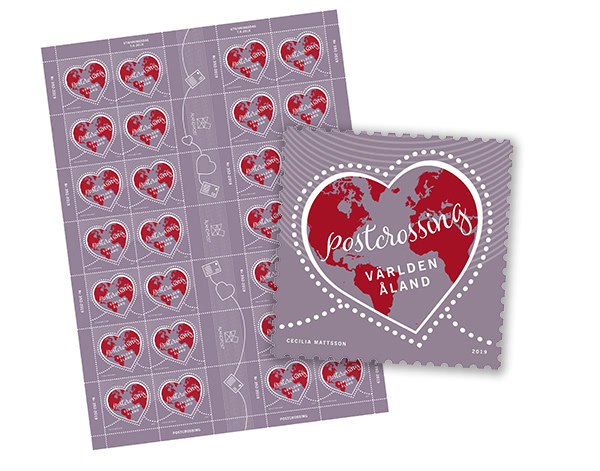 You can carefully detach the inner perforations and transform the stamp into a heart — how cool is that?! This special stamp was designed by Åland Post’s own Cecilia Mattsson, and will be issued in June 7th, 2019. To celebrate the occasion, the Finnish Postcrossing Friends Association is timing their annual trip to Åland to coincide with the stamp launch. Keep an eye on their website for more information soon, but you can already expect many interesting activities as per their usual adventures.